Hi friends! I hope you're having a great day! I had a very nice day! :) After we dropped Brady off at school, Parker, Dustin, and I went to run errands then have lunch. Then Brady came home from school and we hung out at home. This evening we went and had pizza for dinner using a Groupon that I bought. On Tues, we picked up a butterfly habitat that I won from Placer Playtime Publications. I actually won it from the Placer Playtime Publication Facebook Page. If you are local, you should check out this page! Alicia is always giving away fabulous things from local places! This giveaway was sponsored by Lifecycle Celebrations (you can check out their Facebook page HERE.) We won the butterfly habitat and some butterfly larvae. Angie was kind enough to give us butterflies, chrysalis, and caterpillars so that my kids could see all the life cycles. I'd like to introduce you to Max, Ruby, Star, and Kevin. My kids named them. We are going to let the butterflies go tomorrow. We've been feeding them and watching them grow. 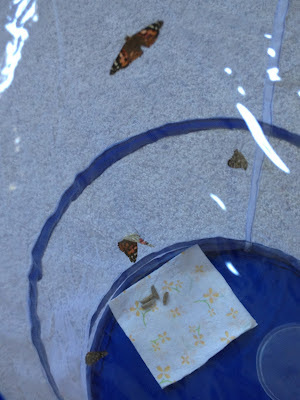 Our new butterflies should be coming out of their cocoons in a couple days and after that we'll have our caterpillars. My kids are really enjoying this experience! Brady is even making a series of short videos. :) If you are local, you should check out Lifecycle Celebrations! They even go to classes, birthday parties, and community events! So glad your kids enjoyed the prize! Love that they named the butterflies. Have a fantastic week.